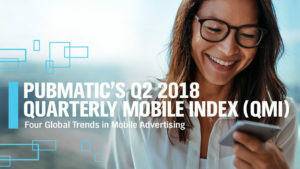 PubMatic, the publisher-focused sell-side platform (SSP) for an open digital media future, released its second Quarterly Mobile Index (QMI) of 2018, which identifies trends in mobile advertising for Q2. The report includes key points around growth in mobile app advertising, highlighting trends in mobile video, private marketplaces (PMPs) and the expansion of cross-channel monetisation. The findings provide in-depth insights for marketers and publishers on how to take advantage of programmatic opportunities in mobile. Marketers should also be aware that ad spend is swiftly shifting away from desktop video toward mobile. Within the last year, mobile ad spend has increased by 239 percent, including 688 percent year-over-year growth via apps and 73 percent year-over-year via mobile web in Q2. PubMatic’s yield and data analytics team analyses over 12 trillion advertiser bids on a monthly basis, utilising the company’s best-in-class analytics capabilities. The Q2 2018 QMI incorporates impressions, revenue and eCPM data from these reports to provide a high-level analysis of key trends within the mobile advertising industry. Data is from the second quarter of 2018 (i.e., April 1, 2018 to June 30, 2018), as well as the corresponding prior year periods. “Monetised impressions” or “paid impressions” are defined as impressions that were sold through the PubMatic platform, and “eCPM” is defined as the effective cost per one thousand impressions.